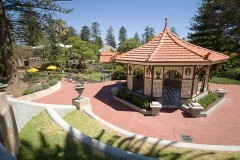 The Civic Centre grounds is public space and therefore no booking needs to be made for family BBQ's or picnics. Please note that the Civic Centre grounds prohibits anti social behaviour and alcohol is prohibited. The BBQ's are free to use at any time in the day however the Town of Cottesloe asks you to respect any weddings that may be scheduled to take place while you are using the grounds. 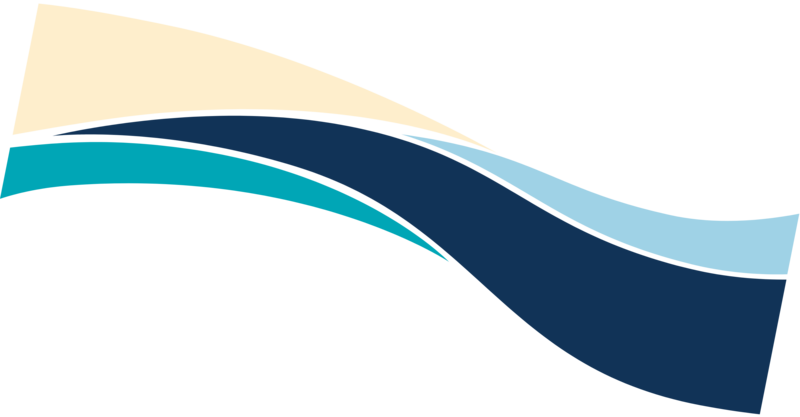 If you would like to apply to hold an event at the Civic Centre grounds (Community event) please fill out the event application form and return to council@cottesloe.wa.gov.au. The Main Lawn is the largest lawn area in the Civic Centre grounds. It is used regularly for wedding ceremonies, receptions and community events. The main lawn is the only area of the grounds that has BBQ's available for public use. The stone work of the stage creates a beautiful setting for special occasions. If you would like to book this section of the grounds for a simple wedding ceremony please complete and submit an application form. For larger wedding ceremonies and receptions, please contact Heyder & Shears Exclusive Caterers on 9221 4110. Alternatively, complete a 'Contact Us' form on the Heyder & Shears website www.heydershears.com.au/contact/. The Town does not allow any other caterers to cater for functions within the Civic Centre. The Secret Garden (also know as Playground 2) is a smaller lawn area nestled into the lower leafy section of the grounds. As the title suggests, this garden is a well kept secret and a perfect location for wedding photographs. If you would like to book this area for wedding photographs please click here. 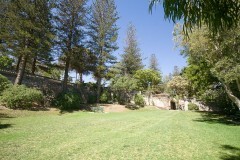 The Sunken lawn is regularly used for smaller wedding receptions and corporate events. The intimate feel of the lawn section creates an exclusive section of the grounds for guests. This area of the grounds is closely linked to the Civic Centre building and toilets and parking is easily accessible. If you would like to book this section of the grounds for a simple wedding ceremony please complete and submit an application form. For larger wedding ceremonies and receptions please contact Heyder & Shears Exclusive Caterers on 9221 4110. Alternatively, complete a 'Contact Us' form on the Heyder & Shears website www.heydershears.com.au/contact/. The Town does not allow any other caterers to cater for functions within the Civic Centre. The Old Tank Stand is the highest point of the Civic Centre gardens. 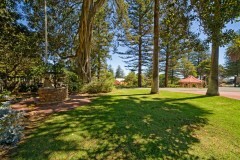 This small paved area overlooks the main lawn and gives a panoramic view of the Indian Ocean. A perfect place to have a small intimate wedding ceremony. The Two Palms is a small grassed area at the front of the Civic Centre. This is a lovely setting for a small picnic or wedding ceremony. If you would like to book this section of the grounds for a simple wedding ceremony please complete and submit an application form. The Rotunda, also known as the 'Summer House', has been restored to its former glory. A peaceful setting to have an intimate wedding ceremony. If you would like to book this section of the grounds for a simple wedding ceremony please complete and submit an application form.